You know you’re in Manila when that iconic clock tower emerges from the hustle and bustle to tell you the exact local time. 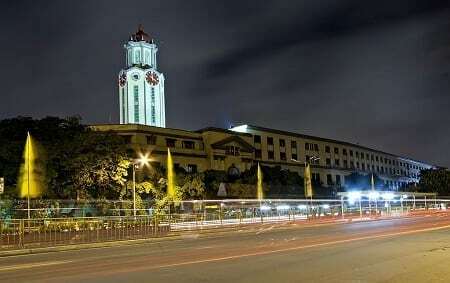 The tower, as most of us already know, is the crowning glory of the City Hall–a historic building that saw Manila’s golden age and how it went downhill from there. Strategically placed at a junction which leads to three bridges (namely, Quiapo, Santa Cruz, and Binondo), the Manila City Hall houses the mayor’s office and other essential departments of the city government. It’s a common knowledge that the present-day City Hall was just a reconstruction of the 1930s building destroyed during WWII. 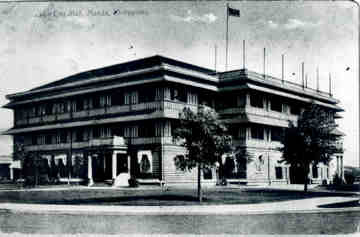 However, the original Manila City Hall is quite older than most people think. 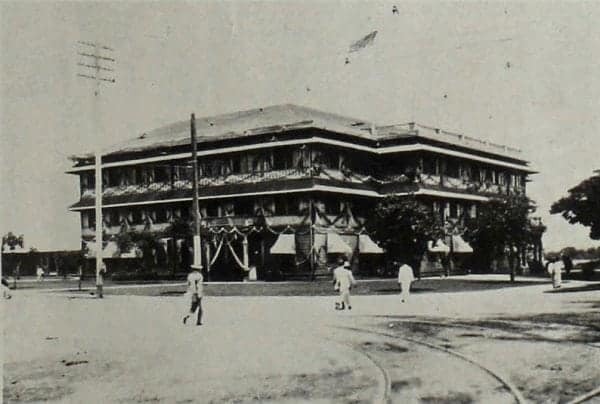 The original Manila City Hall, circa 1910. Source: Landmarks of Manila, 1571-1930 by Visitacion R. De la Torre, page 19. Manila City Hall, minus the clock tower. 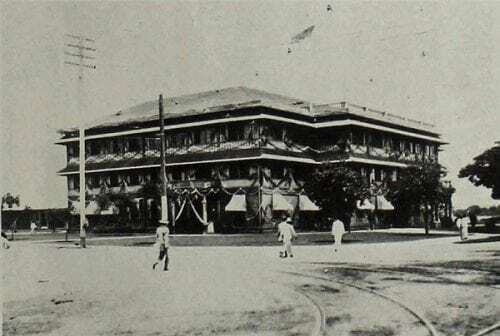 In 1901, the original Manila City Hall was built at Concepcion Street (now Natividad Almeda-Lopez) in Ermita–not too far from the present-day building in Padre Burgos Avenue. 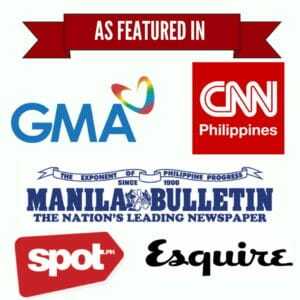 It was constructed under the administration of Arsenio Cruz Herrera, the first Filipino mayor of Manila. After several decades, the wooden structure had fallen into decay. 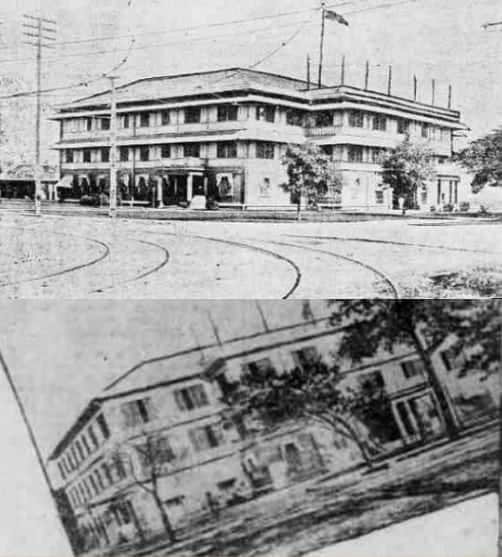 TOP: Original illustration of Manila City Hall from The Pacific Commercial Advertiser, October 1905. BOTTOM: Original illustration of Manila City Hall from The Salt Lake Herald, August 1905. To save it from imminent deterioration, the old building had to be demolished and replaced by a new one. Designed by architect Antonio Toledo, the brand new edifice–now adorned with a hexagonal clock tower–was finished and inaugurated just before the outbreak of WWII. Needless to say, the new Manila City Hall was built at the right place but at the wrong time. 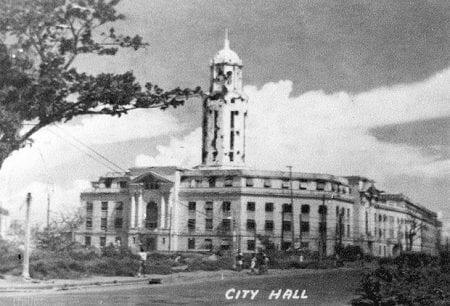 War-torn Manila City Hall, Manila, Philippines 1945. Photo Credit: John Tewell via Flickr. Moreover, the addition of the east wing enabled the City Hall to accommodate other offices. The Big Ben-inspired clock tower, on the other hand, had earned the moniker “international clock” from frustrated Manileños because it often displayed four different time zones. Indeed, the Manila City Hall is a symbol as well as a reflection of the local leadership. But while this famous edifice has successfully transformed into a concrete structure, the same amount of change cannot be said for the city government. The Manila City Hall today. Via Wikimedia Commons. De la Torre, V. (1981). Landmarks of Manila, 1571-1930 (pp. 19-20). Filipinas Foundation.